The goal of this blog is to envision us to build interesting application beyond a website or a simple mobile application, by using the platforms that are already available to us. Android is a great open source mobile platform. On the local device, it has many sensors (for example, GPS, Accelerometer, barometer, etc) to collect much information that a user can or cannot easily gather. The information travels through the internet, works with remote resources, and returns to users with rich customized results and functionality. This awesomeness -- because of much processing power and logic workflow needed on the Cloud -- demands an equally powerful and open platform on the server end. If developers build a powerful server framework from stretch, it is not fun and too costly to be a favorable solution. Therefore, finding an open-sourced, powerful, extensible and scalable framework should be the first thing on the developers' mind. 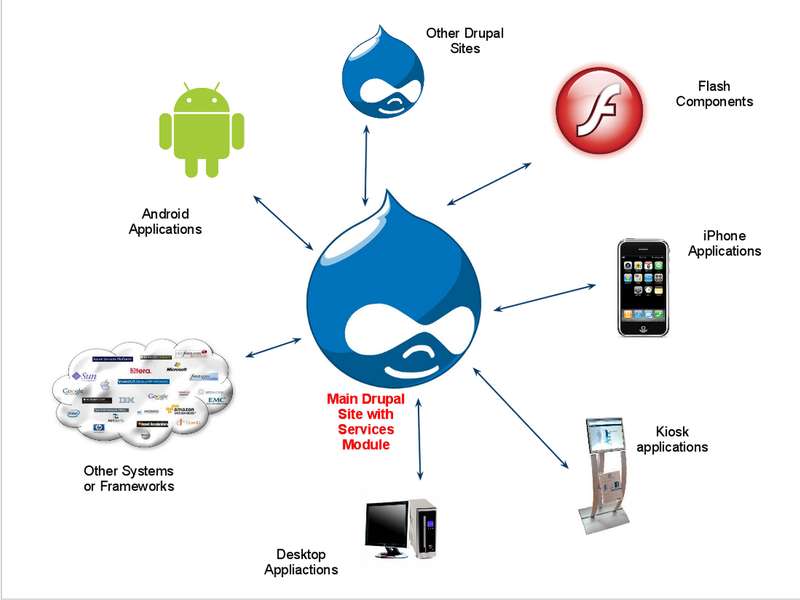 Drupal, on the other hand, is used by web developers worldwide to build sophisticated community interactive websites. Its big success has been proven since many diverse organizations use Drupal as their core social publishing system for websites and internal collaboration applications. With add-on modules support, Drupal is also a web application framework with tens of thousands of features such as flagging system, approximate search, barcode generation, and many other social publishing functions. The Drupal Services module is the add-on module that allows Drupal content to be retrieved and saved through a standard API using pluggable communication mechanisms including XMLRPC, JSON, SOAP and REST. Also, with pluggable authentication mechanisms including OAuth and Key Auth, the communication between frameworks is highly secured. Furthermore, developers can also easily create their own web services to expose additional integration with contribute Drupal modules or custom code. 2.) The development cost is predictively minimal since the huge open source communities support together with hundreds of thousands of existing add-on features. 3.) 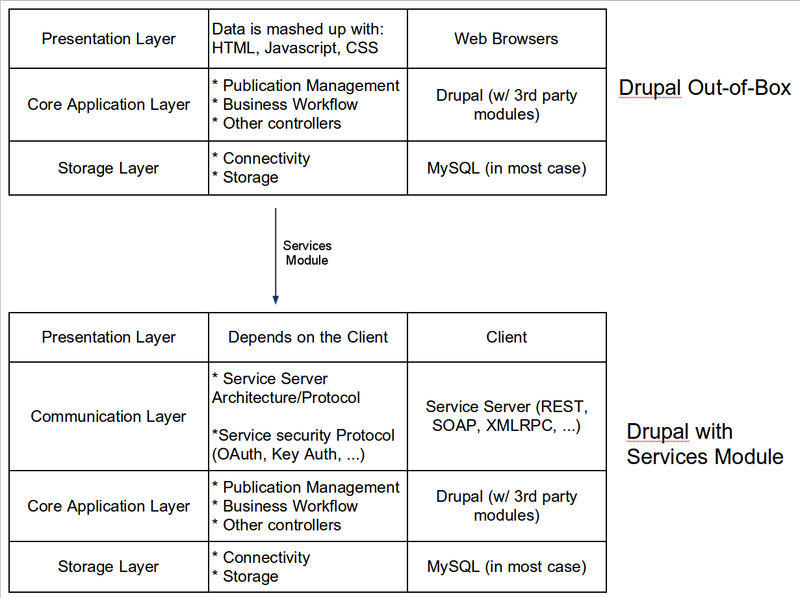 The business logistics and workflow is handled on the cloud by Drupal. As we already have a lot of experience with Drupal. 4.) The application will be able to reach bedroom, garage, bathroom, office, subway, ..., anywhere the mobile goes. I hope the marriage lasts. 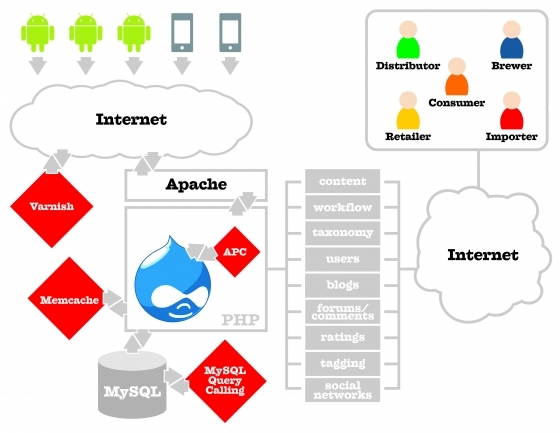 Nice explanation of the Drupal / Android marriage! I am working on creating a similar (though simpler) Android app that would just allow users to browse through the information on my Drupal powered website. It's been tough finding concrete examples of using the Services module, so thank you for the Open Source Android library!